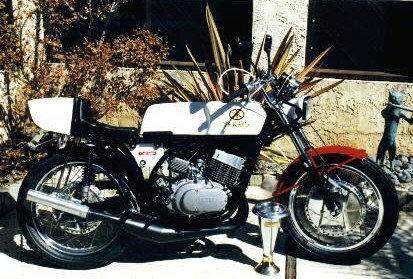 "Streetified" Yamaha TR2 350cc production racer. Bridgestone SR175 dirt track racing. My "streetified" Yamaha TR2 350cc production racer. I thought that many street motorcycles have been converted to racers, so I would go the other way! 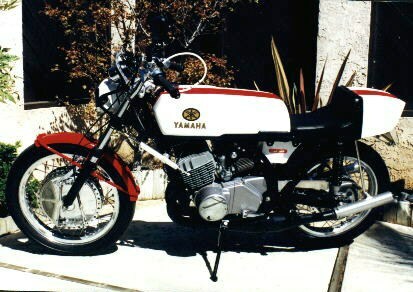 When I bought this TR2 Yamaha, it was nothing more frame, forks, wheels and fuel tank. My first intention was to create a Bridgestone 350 road racer with it, but chose to do it as a street bike instead. The engine is a completely standard Yamaha 350cc R3, upon which the TR2 was based, except for the custom SpecII pipes. The seat, which is a scaled-up version of a standard seat, houses the gell-cell battery, the voltage regulator and tail-light. It and all the major fabrications (injection oil tank, headlight mounts, clipon swan-neck handlebars) were built by the famous road race frame builder Rob North, who has his shop here in San Diego. If you'd like a complete replica of his Daytona- winning BSA triple, he'd be happy to build you one! I did the minor fabricating and all the mechanical work on the bike. It won a trophy for Best Street Special of Show at the Motorcycle Concours at Del Mar, California. Other special touches are the Exhaust Gas Temperature gauge system and the electronic bicycle speedometer/odometer. These racers were produced by the Bridgestone factory for dirt track racing in the US and Japan. I don't know how many were produced, but I would guess at least several hundred as they were offered to all dealers, for sale to any customers, and they were widely advertised. These rotary-valve, two-stroke twins, with chrome-bore cylinders and constant-loss ingition, were modified from the standard 20HP output to 28HP in race trim. They had a five-speed gearbox, a length of 75 inches and a weight of 234 pounds. A quarter-mile performance was listed as 15.3 seconds.